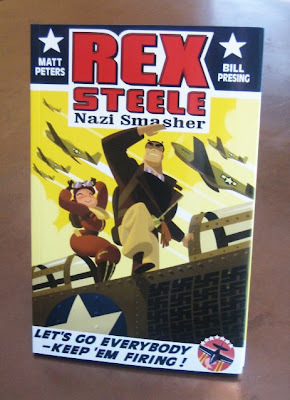 I'm updating the blog shop to include the original 2004 English language Rex Steele: Nazi Smasher trade paperback, which was previously available at www.monkeysuit.com. Monkeysuit is officially shutting down, a sad day indeed. Without Monkeysuit Matt Peters and I probably would have never gotten Rex out there. But I'm hopeful the New York based anthology will make it's triumphant return someday. 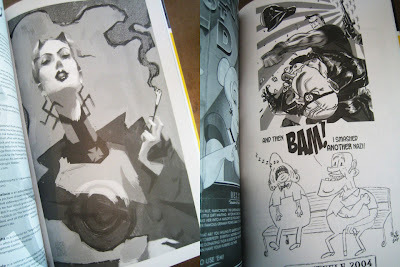 The book is 132 pages glorious black and white throughout, published by Monkeysuit press in 2004. Not very many remain of this edition, and it contains some material that will probably never be reprinted. "Countdown to Annihilation" The original Rex Steele story that was first published in the anthology Monkeysuit vol. 1 in 1999. "In the Bosom of Terror" The second Rex Steele story first published in the anthology "The Bride of Monkeysuit" in 2000. 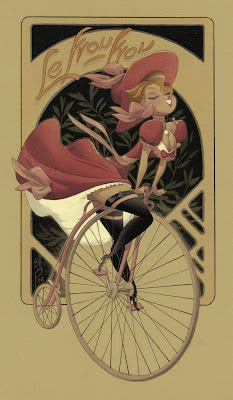 This is the story that was adapted for the animated short film by Alex Woo released in 2004. 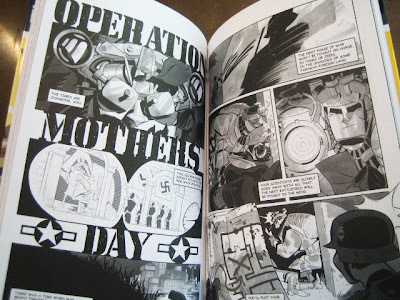 "Operation Mother's Day" The Third Rex Steele story originally published in "Viva la Monkeysuit" in 2001. 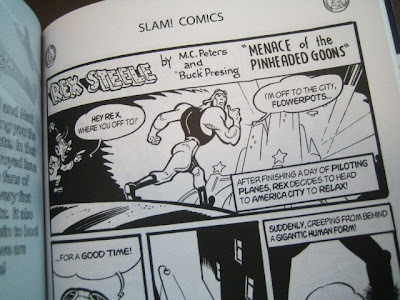 Quite a rarity, "Menace of the Pinheaded Goons". This story is unique to this volume and has never been reprinted (and possibly never will). Written by Matt Peters, plotted by Matt and myself and illustrated by our very talented friend Stephen DeStefano. This is a faux vintage Rex story found in a fictional archive. 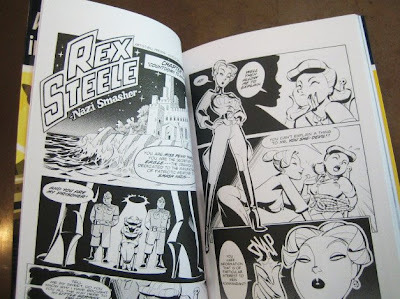 Also unique to this volume is an extensive collection of pin ups, other artists interpretations of Rex Steele. 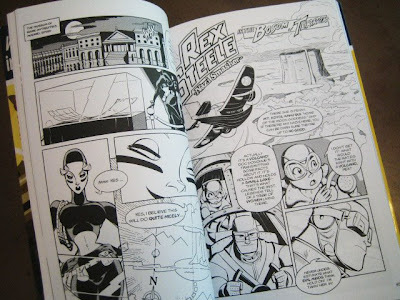 Some of the artists include Bill Wray, Kasu Kibuishi, Ricky Nierva, Mike Wieringo, Dice Tsutsumi, Enrico Casarosa, Jackson Publick, Dean Yeagle, Mark Andrews, Mo Willems and Ronnie del Carmen. And lastly the volume ends with a section devoted to my sketches and developmental drawings which contains some drawings that are in the French volume and some that are not. I am hoping to reprint the full color French edition (with it's two additional stories) in English eventually, but at the moment there is no guarantee. 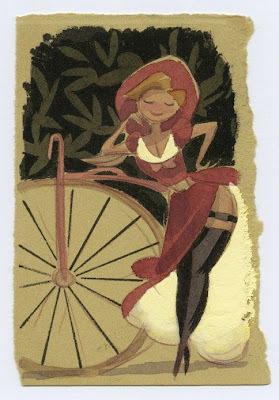 Also, this book will ship from a different location than my pin up books, so I'm afraid combination orders with the other books on my blog will be impossible. I'm really enjoying working on colored paper. It's great starting with the mid tone, you can work from mid to light and mid to dark instead of light all the way to dark. And colors are pretty much automatically unified. I think it's some kind of pastel paper. It tears up easily if I erase but it absorbs color nicely and I can get some really subtle grads on it. 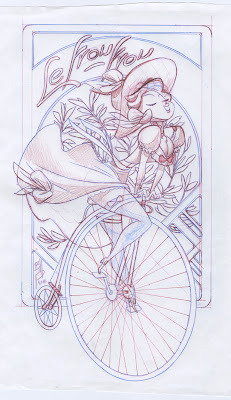 I've been working on a sequel to my Le Frou Frou piece lately as a wedding gift for some good friends. 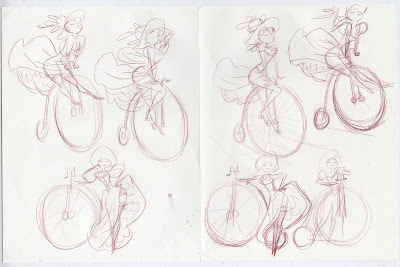 Here are most of my early sketches, my first impressions on the idea. 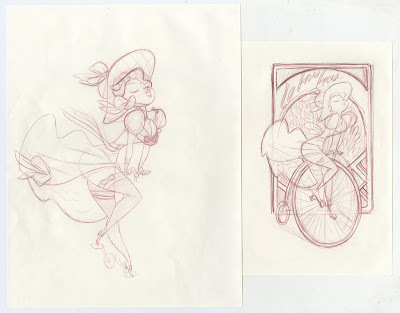 Here on the right is my final sketch, on the left is the final tight figure drawing. This is the final comp with all the elements. As well as a shading study. I've actually finished the piece already but didn't want to post it until the gift was given. I'll post the finish soon. 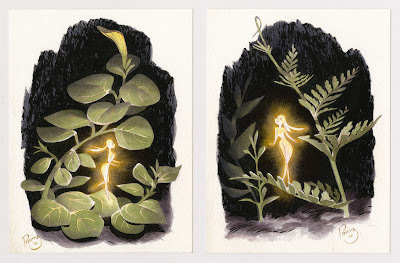 I just managed to finish these two color sketches for the Totoro Forest Project "Forest Hero" tickets. Just in time too, the auction is tomorrow. For those who don't know the highest level or "Hero" level tickets sold for the auction get a copy of the book of the show as well as an original piece of art. 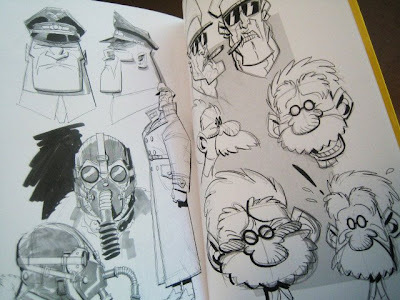 Here are some other great examples by Dice Tsutsumi, Ronnie Del Carmen, Enrico Casarosa and Scott Morse.